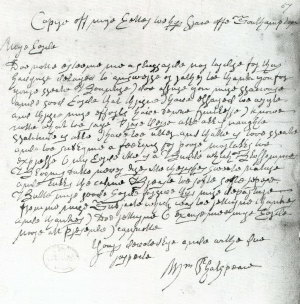 A letter supposedly written by Shakespeare (forged by Ireland) expressing gratitude towards the Earl of Southampton. As literacy rates rose during the eighteenth century, a kind of cult-like reverence for the work of William Shakespeare emerged. Theaters staged his plays repeatedly, and collectors eagerly sought out any relics related to his life. The bookseller Samuel Ireland was one of the most passionate of these Shakespeare-worshiping relic hunters. He devoted his life to the pursuit of Shakespeariana, in the process neglecting his talented young son, William Henry Ireland (1777-1835). That is, until his son brought home from the law office where he worked a mortgage document apparently signed by Shakespeare himself. At the time William Henry brought home the Shakespeare document, in 1794, he was ony eighteen. He claimed he had found the document among the estate papers of a client who desired to remain anonymous. Samuel Ireland was ecstatic at what his son had found, and grew even more so when William continued to bring home other spectacular finds, including a love letter written by Shakespeare to Anne Hathaway and eventually a previously unknown historical drama by the Bard titled Vortigern. Arrangements were made for Vortigern to be performed at the Drury Lane Theatre on April 2, 1796. The theater's owner half-suspected a fraud, but decided that there was enough public interest in the play, whether or not it was a fake, to warrant a performance. The actors, however, were more skeptical and not so willing to play along. To indicate their displeasure, they hammed their way through the performance, and when the lead actor, J.P. Kemble, arrived at the line "And when this solemn mockery is ended," he delivered it with such emphasis that everyone in the audience knew he was referring to the play itself. This prompted an outburst of laughter and applause. After that infamous opening night, the play was never performed again. A few weeks later William Henry confessed that the play and other documents were all his own work. His father, however, refused to believe the confession and insisted until the day he died that the Shakespearean treasures his son had brought home all had been real. Mark Jones (ed. ), Fake? The Art of Deception, University of California Press, 1990: 155-156.